4 Can I Refreeze Cheesecake? There are a couple of things you need to know about this recipe before you get started. The first is that it doesn’t taste much like traditional cheesecake. 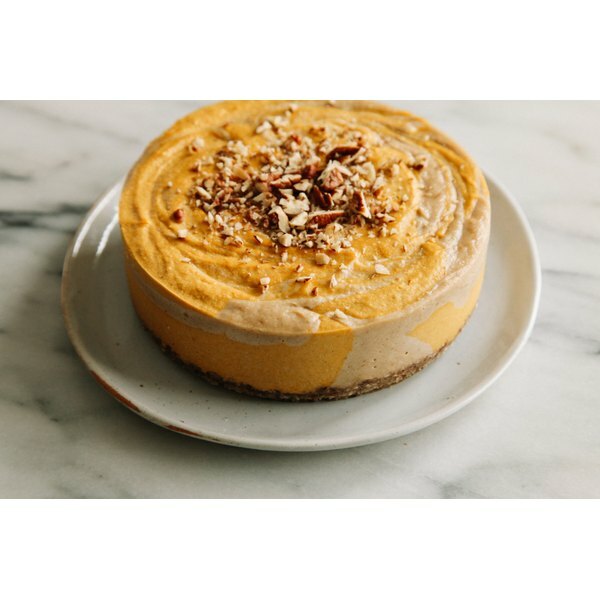 So if you’re looking for one of those, you should check out this indulgent pumpkin cheesecake recipe and go that route, instead. The second is that although this particular cheesecake is vegan and gluten/refined sugar-free, that doesn’t mean you can have your cake and eat it too. Yes it’s loaded with good-for-you fats and natural sugars, but it’s loaded with a lot of them. So, as always, dessert in moderation, folks. 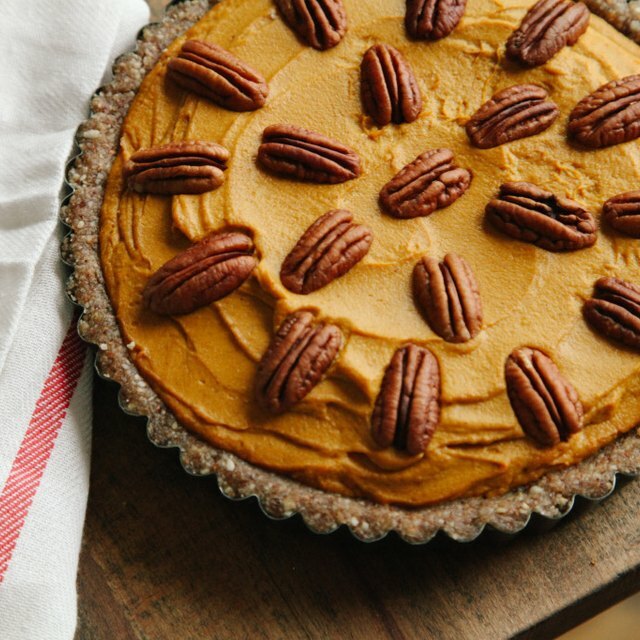 And if you’re still looking for extra Thanksgiving desserts to make for your favorite vegan, how about no-bake pumpkin pie or a healthy pecan pie? Notes: If you’re not concerned with preserving the raw status of this cheesecake, feel free to use almond milk from the carton and/or pumpkin puree from the can. If you’d like to try making raw pumpkin puree, you can grate the flesh of a pumpkin, then spread it on a parchment-lined baking sheet to dry for 24 hours. After that you can transfer it to a food processor and blend until smooth. It tastes a bit mild compared to the canned pumpkin, but is still delicious. Line the bottom of a round 6-inch springform cake pan with parchment paper; set aside. In a food processor fitted with the S blade, blend the pecans and coconut into a fine meal. Add the dates and process just until crumbly, then press the mixture into the prepared cake pan; set aside. In a high-powered blender, blend the cashews (make sure you discard the soaking water), 10 dates, lemon juice and almond milk until smooth, about 1 to 2 minutes. Remove 3/4 of the cashew cream from the blender and put it in a bowl. Add the remaining five dates and the pumpkin. Blend until smooth, scraping down the sides as needed. When you’re ready to assemble the cheesecake, alternate dropping heaping spoonfuls of each mixture into the cake pan. The bigger the spoonfuls, the less swirled your cheesecake will look. Once you’ve added both mixtures entirely, tap the pan on the counter a few times, then cover with plastic and freeze for at least 6 hours, or until set. Once it’s set, cover it with plastic. It will keep frozen for up to six weeks. The night before serving, transfer the cheesecake to the refrigerator. Serve within 24 hours or transfer it back to freezer.